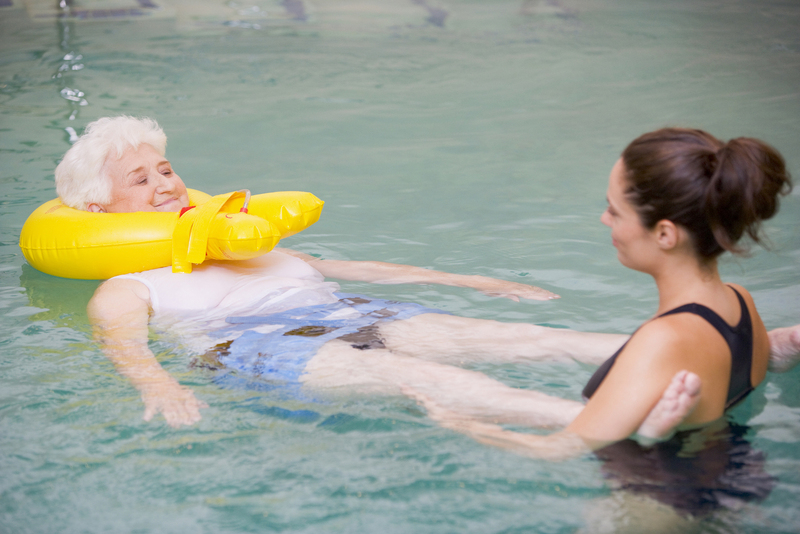 There are so many fabulous benefits of aquatic therapy for people suffering from Parkinson’s disease. Did you know that just breathing while submerging your body in warm water can improve posture, balance, muscle rigidity, decrease stress, depression and anxiety and improve fatigue? Amazing, isn’t it? You may not correlate aquatic therapy to deep breathing, but the hydrostatic pressure of the water creates a more deliberate effort in breathing as you are also expanding your lungs against the pressure of the water around you. Exercises such as yoga, Ai chi and Watsu in warm water are all ways to gently exercise, sustain mobility and balance while focusing on breathing. These effortless exercises can actually increase your breathing capacity on land as well. Why is this so important for people with Parkinson’s disease? Muscle rigidity makes you feel tensed and causes the forward-leaning posture which then affects balance and increases your chance of falling. The muscles of the diaphragm get inhibited from expanding causing breathing difficulties and rigid abdominal muscles cause constipation. Deep breathing while chest deep in warm water relaxes the tight and spastic muscles. While raising the body temperature it causes the blood vessels to dilate, resulting in increased circulation. You are able to breathe deeper, have better posture, improved balance and improved bowel function. Stress, depression and anxiety are three very different conditions. However, many people with Parkinson’s experience a combination of these three. Breathing exercises and the gentle massage on your body by moving against the water help you de-stress. Numerous studies have shown this to be a magic drug for many people with depression and anxiety disorders, and should be more widely prescribed by mental health care providers. Fatigue is another common symptom of Parkinson’s. Some may also be coping with cognitive problems known as “Parkinson’s apathy”, e.g. difficulty initiating projects, inability to follow complex instructions, short-term memory loss and difficulty in switching gears midstream. The warmth of the water, breathing exercises and gentle massage against the water and physical exertion all help you get better quality of sleep, which in turn causes you to have more energy during the day. Get doctor approval. Seek approval from your primary caregiver before starting any new exercise program or altering a current program. Never swim alone. For safety reasons, always get in the pool with a loved one, caregiver, instructor or therapist. Keep balance. If “freezing” occurs or balance is lost, use the side of the pool, or a flotation device or your companion to help re-establish alignment and safe movement. Set achievable goals. Leave the session feeling energized, not exhausted and frustrated. Work with your instructor/therapist to develop reachable goals based on your abilities, goals and needs. Go at a safe pace. Be careful to not over-exercise. One achievable goal may be to reduce fatigue, not be fatigued. Hydrate. Being in the pool could cause dehydration which in turn could affect your physical and mental health negatively. Remember to take sips of water during the session.